The Museum collects artifacts related to the history of our building and its various uses since it was first built in the 1880s. Sometimes these artifacts come from former tenants and other D.C. historians, but more often than not they come from within our own walls and floors. The historic home of the National Building Museum was built between 1882 and 1887 and was in constant use by the government until it underwent extensive renovations in the early 1980s to be transformed into the Museum. During those renovations, the site turned into a mini archaeological dig of sorts, with artifacts related to the construction of the building found in the basement, museum grounds, and even under the floors. While most of the items found were the common ballast and trash related to any construction project—cigarette boxes, tin cans from a quick lunch, broken construction tools, leftover tiles and building supplies—one set of objects stood out from the rest: many rooms had a solidary shoe tucked away under the floor boards. The mystery of the shoes grew as more and more of them were found. Some were typical laborers’ boots but others were women’s heels, fancy shoes, common shoes, worn shoes, and even hardly used shoes. The only thing they had in common is that they all dated to the original construction of the building (around 1887), were always a single shoe in a room (no pairs) and were clearly put under the floors for a purpose. There were too many of them in too specific of locations to be randomly discarded trash. 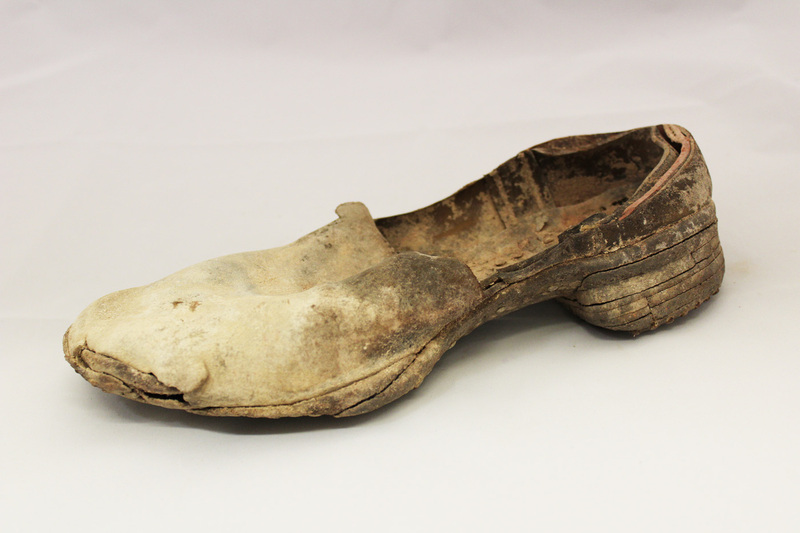 Further research revealed that these were most likely “concealed shoes,” a worldwide superstitious phenomenon. Shoes are generally linked with luck and it is believed that placing the shoes under the floors would provide luck or protection for the building, room, and inhabitants. Think of how we tie shoes to the back of a car at weddings or throw them over telephone lines—all of this originates from the same idea. We even bronze baby shoes as a memento. Shoes can also be associated with a specific person, as they retain the shape, and in some ways the personality or the essence of the former wearer. Today the concealed shoes are all together in the Museum’s secure collections storage area, quite possibly the luckiest place in the building! As we go about our day with the artifacts we like to think we are connected to the men and women who worked in these same rooms over 100 years ago, not just by the structure they created, but by the mementos they left behind to protect us and the building for generations to come.